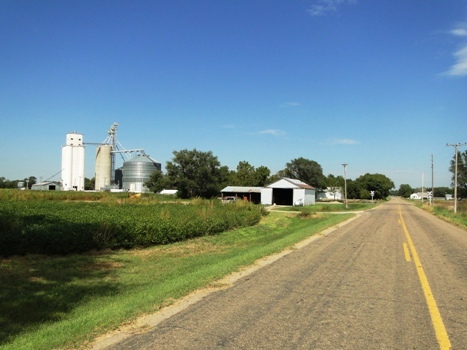 Asherville claims to be one of the oldest although not one of the larger towns in the Solomon Valley. John Rees, one of the first settlers, had a grocery store at the town site as early as 1867. Rees came to America from Liverpool, England, in 1841, locating in Pennsylvania and Missouri before enlisting in the army during the Civil War. While in the army he rose from a private to major. After the war, he came to the Asherville area on April 26, 1866. He was elected to the state legislature in 1872, held the office of Justice of the Peace for 10 years, and was postmaster for seven years. He was the first postmaster in Mitchell County, the Asherville post office being established in 1869. His son, Sherman Grant Rees, was the first white child born in Mitchell County. Rees also claimed to have sold the first dry goods and groceries in Mitchell County. The village of Asherville began in the early 1870s as a part of the Rees homestead. It was plotted and laid out but never incorporated. The plat was recorded with the registrar of deeds on March 15, 1902. John Rees did his best trying to be a one man chamber of commerce for Asherville. The following letter from John was published in the Junction City Union on February 19, 1870. This country was first settled in the spring of 1866 - nearly four years ago - then a desert-looking place. Buffaloes and Indians were all that could be seen, and owing to the oft repeated murdering of our citizens by Lo has retarded the settlement to a great extent. Troops have been sent here several times for our protection, except the company of U.S. troops sent here from Fort Hayes last spring, commanded by First Lieutenant Edward Law, G Company, 7th Cavalry, in the company of Lieutenant March. These officers and men bore a noble part in trying to protect the settlers of this valley, going night and day to all points where any alarm was given and in fact were the only company of men in the regular service who seemed to take interest in protecting the frontier settlers. During those four years, 16 of our settlers have been killed - only one being killed in 1869. This was owing to the troops sent here, and I am in hope that we will be blessed the coming summer with the same protection as that of last summer. I under stand there are to be troops sent here by the 1st of April next, but I am afraid that if we have an early spring that Indians will certainly come in before that time. But as an old saying, "better late than never." Since the talk of running a railroad up this way, immigration seems to pour in here as thick as grasshoppers did the year of the drought. Bur let them come: we had good crops last year and have some grain to sell. The sandstone is found in the bed of the river, forming nine or ten No. 1 mill sites. There are already three mills under process of construction, one by Mr. Marshall 2 1/2 miles west of this place and 5 miles west of the east line of the county. This mill is in the heart of one of the best valleys in Kansas. Here would be a good place for a store, as we have none in the county. Our blacksmith, Mr. Mauk, is an old Kentuckian and knows how to do work well at low figures. Farther up the valley we come to the Willow Spring, 11 miles west of the east (county) line. Here Mr. Hersey of Abilene is constructing a saw and gristmill. They have laid out a town to be called Beloit, and with the expectation of the county seat. As the county is, as yet, not organized, it will be somewhat mixed to tell where it will be. All who want a home of 160 acres of land, under the homestead law, by simply paying $14.50, and proving settlement of the same for five years, come out and see us. A word to the ladies: If you want to get married, come out here, as we have a host of bachelors; but be sure to bring plenty of means with you, for that is the excuse "can't support a wife until I raise a crop." Among those killed in the Indian raids in August 1868 were David Bogardus, Braxton Bell, and Elizabeth Bell. Two girls, Ester and Margaret Bell, were captured but later recovered. ​The small Bogardus-Bell Cemetery north of Asherville is a monument to those pioneers who first settled this land.